Although I had previously heard a lot about the clown duo Morro and Jasp, it wasn’t until Wednesday night that I got to see what they were all about firsthand. As I am not very familiar with clowning and what it involves, my idea of it preceding this performance was very basic and probably misguided. So, in truth, I honestly didn’t think I’d enjoy myself at Factory Studio Theatre that night. But enjoy myself I did. I’m pretty sure I was expecting to walk into a really bad birthday party for small children. Yet I was pleasantly surprised to discover that clowning can be fun and dynamic, even for adults. Of Mice and Morro and Jasp is a story similar to Of Mice and Men, but with a happy ending. While Steinbeck chose to expose the cruelty of the world we live in, Morro and Jasp prove that there is always hope and the ability to make a choice no matter the circumstances. George and Lennie are smothered by their reality, while Morro and Jasp, although sharing many similarities to Steinbeck‘s characters, make a definite choice to rise above it. As I walked into the theatre Wednesday night, each seat had a stuffed bunny underneath it. I’m glad I had the foresight to sit away from the aisle and towards the back because I had an inkling that this was going to involve a lot of audience participation and, well, ‘better someone else than me’. The show began with Morro and Jasp panhandling with a hilariously pathetic song. Off to a good start, the production only got better as time wore on. Not only were they extremely funny, it was difficult not to fall in love with these characters. I developed an emotional attachment towards their struggle and really hoped they would succeed. Shows that are able to achieve this balance are truly special in my eyes. It is hard to decide what I enjoyed most in Of Mice and Morro and Jasp. 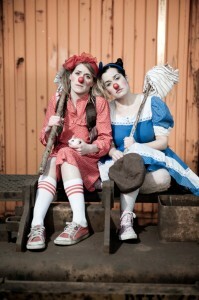 The commitment Heather Marie Annis and Amy Lee had to their clowns was amazing. Their choices were so clear and specific yet organic that I couldn’t tell when they were following a script or when they were off-the-cuff. Technically, nothing was overlooked either. The set, props, and costumes were very enhancing yet unobtrusive to the production. Kudos to director Byron Laviolette for effectively bringing all these elements together to create such a powerful world. From when they succeeded in stealing an audience member’s wallet, getting intoxicated on shots of coca-cola, dancing with a bearded lady, to their game of ‘Wack-a-Morro’, it was all so good. However, my favourite moment was when we were able to ambush Morro at the end of the show with the bunny rabbits found under our seats. It was quite affecting to be involved in the outcome of the production. Completely funny and endearing, this show is fantastic. Performances run Tuesday through Saturday at 8pm until February 8th, with a matinee on Saturdays at 2 pm. Tickets are $25 and $20 for students/seniors/arts workers. Tickets can be purchased online or by calling 416 504 9971.